The largest object in the sky, the sun is the source of light, heat, and life. It can also be a symbol of destructive power. Since earliest times, people in all parts of the world have observed the position of the sun and its rising and setting throughout the year. Many cultures have created solar calendars to govern such things as the planting of crops and the timing of religious festivals. They have also given the sun a major place in their mythologies, often as a deity. Solar Deities. The pantheons of many cultures have included a sun deity, usually a god but occasionally a goddess. Some myths reflect the sun's vital role in supporting life: Solar deities are often creators who bring people into existence. Native Americans from the Pacific Coast, for example, tell how the sun god Kodoyanpe and the trickster Coyote together created the world and set about making people to live in it. Solar deities have also been associated with fertility of people and the earth. The Hittites of ancient Turkey worshiped Arinna, an important goddess of both the sun and fertility. In traditional myths from Uganda in Central Africa, the creator god Ruhanga, the sun god Kazooba, and the giver of life Rugaba are all the same deity. Throughout history, many different cultures had solar deities and myths about the sun. 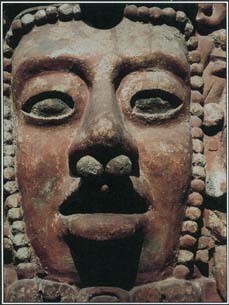 This head of the Maya sun god is located on a pyramid wall in Campeche, Mexico. peoples had Belenus, the god of sunlight. Besides driving away the predawn mists and fogs each day, Belenus could melt away disease from the sick. When the Romans conquered the Celts, they identified Belenus with their own sun god, Apollo, who was also a god of healing. As the most important and splendid deities of their pantheons, some solar deities have been associated with earthly rulers, the most powerful people in society. The Incas of Peru in South America regarded the sun god Inti, their chief deity, as the ancestor of the Inca royal family. According to Japanese tradition, the country's imperial family is descended from Amaterasu, the sun goddess. Myths About the Sun. Some solar myths explain the sun's daily movement across the sky from east to west and its disappearance at night. Such stories often take the form of a journey, with the sun deity traveling across the heavens in a chariot or boat. Helios, a Greek solar deity later identified with Apollo, was a charioteer who drove his fiery vehicle through heaven by day. At night he floated back across the ocean in a golden bowl, only to mount his chariot again the next morning. The Navajo people of the American Southwest portray their sun god as a worker named Jóhonaa'éí, or sun bearer. Every day Jóhonaa'éí laboriously hauls the sun across the sky on his back. At night, he hangs the sun from a peg in the wall and rests. The Egyptian sun god Ra made a similar circuit. Each day he traveled across the sky in his sun boat, and at night he passed through the underworld, greeting the dead and facing many dangers. Ra's daily cycle was more than a journey, though—it was a daily rebirth. Dawn saw the newborn sun god rise in the sky. During the morning he was a child, at noon he was mature, and by sunset he was an old man ready for death. Each sunrise was a celebration of the god's return, a victory of life over the forces of death and darkness. The Celts also viewed the sun's journey as a cycle of death and rebirth but on a yearly rather than a daily cycle, with midwinter as death and spring as rebirth. The Celtic celebration called Beltane, held in spring, honored their sun god Belenus. In some solar myths the sun is paired with the moon. The two may be husband and wife, brother and sister, or two brothers. In the mythology of many Native Americans, the sun god and moon god are sister and brother who also become forbidden lovers. The moon god's face is smeared with ash from the sun's fires, which accounts for the dark patches on the moon's surface. In some accounts, the moon flees in shame when he learns that his lover is also his sister. This is why the moon leaves the sky when the sun comes near. Many cultures have myths of monsters or evil spirits that steal or devour the sun or stories of the sun falling from the heavens or withdrawing its light for a time. Some of these myths may explain eclipses, times when the earth's shadow temporarily blots out the sun or moon. A solar eclipse creates a period of eerie near-darkness in the middle of the day—an event that surely cried out for a reassuring explanation. A well-known myth about the Japanese sun goddess Amaterasu tells how she became so angry with her brother, who was misbehaving, that she retreated into a cave. The goddess's withdrawal deprived the world of light and warmth. Finally, the other gods tricked her into emerging. If one sun is good, are ten suns ten times better? Not according to the Chinese myth of Yi and the ten suns. Yi, a famous soldier, was an archer of great skill. At that time, ten suns lived in the Fu Sang tree beyond the eastern edge of the world. Normally the suns took turns lighting the earth, one sun at a time. The suns grew rebellious, and one day all ten of them rose into the sky at the same time. The extra light and heat pleased the people below—until their crops shriveled and their rivers began to dry up. The Lord of Heaven sent Yi, the divine archer, to handle the problem. Yi shot nine of the suns out of the sky. According to a traditional myth from the Hindu Kush mountains of Afghanistan, the giant Espereg-era once stole the sun and the moon. The hero god Mandi disguised himself as a child and tricked the giants into adopting him. After a time with the giants, Mandi rescued the sun and moon and rode off with them on a magical horse. The supreme god then hurled them into the sky to shine on the world. See also Amaterasu ; Apollo ; Aten ; Inti ; Lug ; Mithras ; Moon ; Ra (Re) ; Shamash ; Stars .